After getting some info from the 2WG guys I decided to go with ordering that bag. I hope it’ll work well; I did see some mixed reviews on the good old Internet, mainly that it was not durable enough, especially zippers. We’ll see. I’m pretty good to my equipment. They’ll take it back after 30 days for any reason and up to a year for defects, so I figured I couldn’t lose (much). Is it easy and quick to get on and off the bike? Will my lunch jar fit in (measurements given)? The answers were yes, and yes, according to them. The attachment process is top hooks for the rack plus two bottom rings and securing straps (velcro). I was charmed to hear that apparently the guy who answered my email won a wager that a 5-year-old could do it herself after a demo. I’m smarter than a 5-year-old — I hope! The lunch jar would fit in a shoe pocket (what I thought, but I wanted confirmation). They also suggested they could custom-make one that would fit the lunch jar on top (in the area where you can stuff a few extra things), but I don’t think it’s necessary nor is it ideal to have the jar on its side. Still, I thought it was very thoughtful of them to suggest it. I’m looking forward to trying the bag out on the rack I ordered from Nashbar (a Blackburn EX-1) and finally being a proper cargo-carrying commuter. 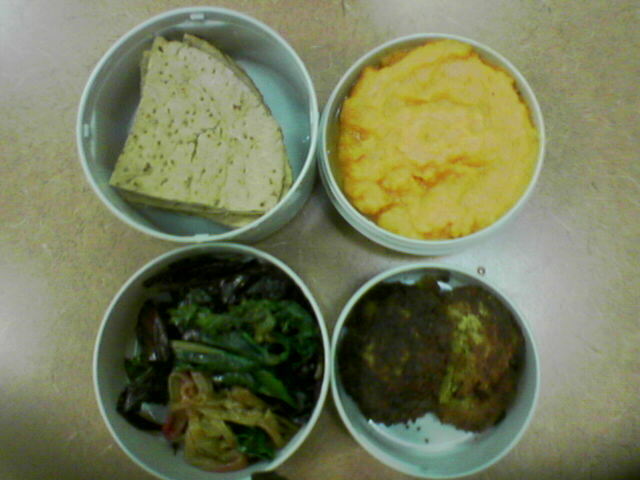 The promised post with tan food bentos! Very exciting, I know. This is probably the most tan bento. 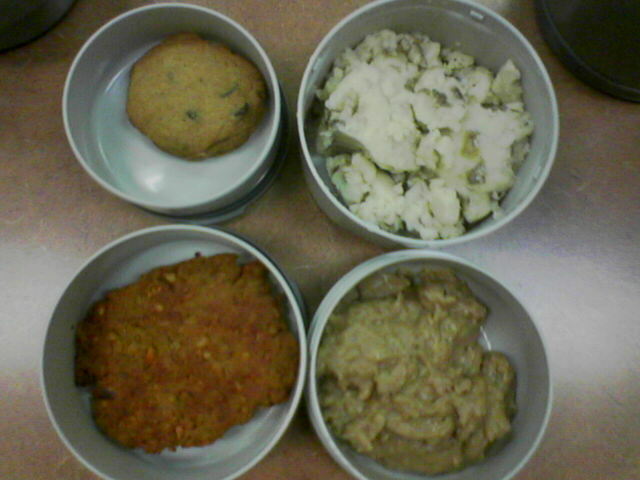 The chickpea cutlets are from Veganomicon. They’re made with chickpeas, wheat gluten flour, and some tasty seasoning. The lemon zest makes them super-cool. The cookie recipe was from Vegan with a Vengeance, though they got a little overcooked. 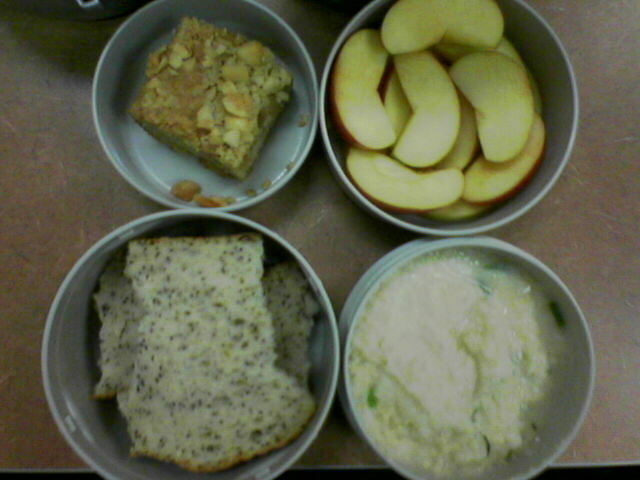 It’s almost like a kid’s school lunch, except totally vegan and much tastier since it’s all made from real food. The soup is from Almost Vegetarian, but I veganized it by using soymilk instead of milk/cream and replacing the egg yolk with a potato (both are thickeners in this context). It was really good that way; I probably never would have noticed the difference had I not been the one making it. The Macadamia Nut Blondie is from Vegan with a Vengeance. It’s like a brownie, but not chocolate. And incredibly rich from the macadamias. Very big hit at cookie parties and work birthday celebration! 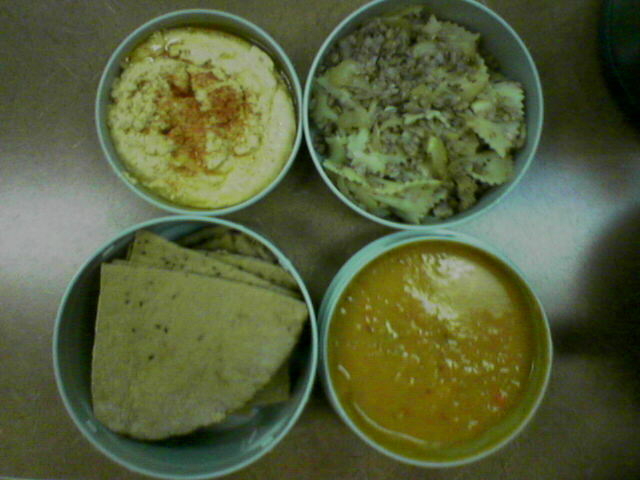 This hummus was homemade to be more like the TJs kind, as an experiment. I put more water and tahini in than normal. It probably still needed more tahini and more garlic, but it’s good. I’m still eating the leftovers this week. The Roasted Bell Pepper Soup is also from Almost Vegetarian, but it’s vegan with no alteration. And tasty and easy, as long as you have the bell peppers roasted already. It’s just a mirepoix, plus bell peppers, a potato, and broth. I put more bell peppers in than called for because otherwise you taste the potato and celery too much. The falafel are homemade from the VwaV recipe. I liked it, but it could have used more kick and less liquid. I prefer the recipe from my British Tasty Vegetarian book. The greens and onions were a good mix. This was leftovers from the Valentine’s Day celebration. The theme was supposed to be cashews, but the original cupcakes we inteded to make (Cashew-Cardamon) required soymilk powder for the cashew butter icing, which I couldn’t find, so we went with pineapple as a theme. The PCQ stir-fry, from Veganomicon, was innovative and tasty, with basil and mint among the ingredients. The pineapple cupcakes, from Vegan Cupcakes Take Over The World, were lightly sweet and tropical. The lentil stew is an old recipe of my mom’s and kind of got thrown in there a bit. 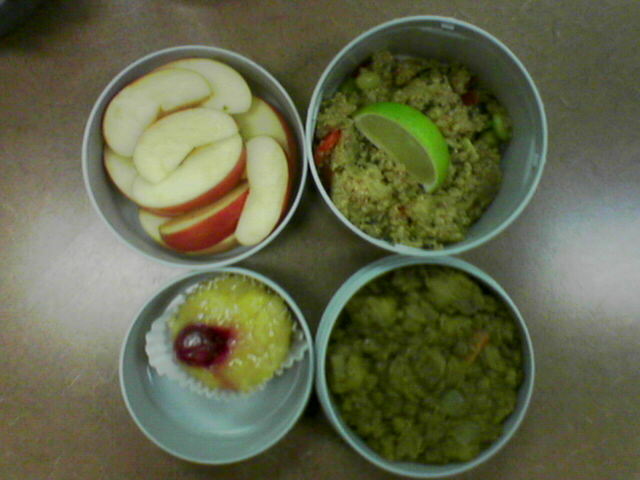 All bentos in this post are totally vegan. Yay!